The global market for automotive foams is being intensely driven by the significant growth of automobile manufacturing across the world, thanks to increasing disposable income and the rising trend of urbanization, especially in emerging economies, such as Japan, China, and India. The cost efficiency, low density, and reduced weight of automotive foams is also supporting their adoption considerably, leading to the market’s growth. By 2017, the worldwide automotive foams market is expected to present an opportunity of US$22.53 bn. Researchers predict a high future growth of this market, which will expand at a CAGR of 9.40% between 2017 and 2022, reaching a value of US$35.38 bn by the end of 2022. The assessment of the global automotive foams market is broadly conducted on the basis of the type of material, sales channel, application, and the type of vehicle. Based on the type of material, the market is bifurcated into phenolic, polyurethane, styrenic, polyolefin, polyvinyl chloride, and melamine. Among these, the demand for polyurethane is relatively greater than other materials. Expanding at a CAGR of 8.50% between 2017 and 2022, this segment is expected to remain on the top over the next few years. Based on the sales channel, the market is classified into original equipment manufacturers (OEM) and aftermarket. By application, the market is categorized into seating, instrument panels, gaskets and seals, door panels, water shields, headliners, and noise, vibration and harness (NVH). On the basis of the type of the vehicle, the market is segmented into luxury passenger cars, mid-sized passenger cars, compact passenger cars, premium passenger cars, heavy commercial vehicles, light commercial vehicles, and two-wheelers. In terms of the geography, the worldwide market for automotive foams is divided into Europe, the Middle East and Africa (MEA), North America, Asia Pacific excluding Japan, Latin America, and Japan. The global market is currently led by Asia Pacific excluding Japan, thanks to the continual rise in the region’s automotive industry. With China surfacing as the key consumer of automotive foams across the world, this region is expected to remain dominating the global market over the next few years. Analysts expect the APEJ market for automotive foams to rise at a CAGR of 10.10% during the period from 2017 to 2022. The substantial rise in the heavy commercial vehicle and the passenger car industries is the main driving force behind the growth of the market for automotive foams in this region. The increasing involvement of companies into mergers, acquisitions, and alliances, rising number of product launches, and the accelerated research and development activities are expected to raise the potential of this regional market in the years to come. Other regional markets for automotive foams are also projected to witness steady growth over the forthcoming years. Among these, Europe and North America are anticipated to hold substantial share in the global market in the near future on account of the rising demand for automotive foams across the world. The business landscape of the global automotive foams market is highly competitive and fragmented due to the presence of a number of players. At the forefront of this market are Woodbridge Foam Corp., The Dow Chemical Co., Adient Plc., Recticel, Caligen Foam, Saint-Gobain SA, BASF SE, Lear Corp., Zotefoams Plc., and Bridgestone Corp. It also examines the potential of this market at the global as well as the regional level. Further, an in-depth assessment of the value chain, which provides an all-inclusive overview of the global market for automotive foams has been offer in this study, encompassing the analysis of the market’s attractiveness, in which, the end users are benchmarked on the basis of their market size, rate of growth, and general attractiveness. The research study provides an in-depth assessment of various factors that influence the sales of automotive foams across the world for wise decision making. It also presents a thorough study of the attractive opportunities, entailing the untapped, as well as recently explored factors, which are anticipated to propel the market over the forthcoming years. Further, it conducts an analysis of the value chain to assist in understanding the market systematically. This analysis of the value chain includes detailed examination of the roles of various significant entities involved in the worldwide market for automotive foams, from the raw materials suppliers to the end users. A number of procedures employed in the production of automotive foams have also been examined in the analysis of the value chain. Largely, the global market for automotive foams is analyzed on the basis of the type of the material, sales channel, application, type of the vehicle, and the geography. Based on the type of the material, the market is classified into phenolic, polyurethane, styrenic, polyolefin, polyvinyl chloride, and melamine. By sales channel, the market is categorized into original equipment manufacturers (OEM) and aftermarket. Based on the application, the report bifurcate the market into seating, instrument panels, gaskets and seals, door panels, water shields, headliners, and noise, vibration and harness (NVH). On the basis of the type of the vehicle, the market is segmented into luxury passenger cars, mid-sized passenger cars, compact passenger cars, premium passenger cars, heavy commercial vehicles, light commercial vehicles, and two-wheelers. In terms of the geography, the research study broadly classifies the global automotive foams market into North America, Europe, Latin America, Asia Pacific excluding Japan (APEJ), the Middle East and Africa (MEA), and Japan. These geographical segments are, then, assessed on the basis of the current and imminent trends in each of the regions in order to provide an insight into the current and expected demand for automotive foams there. The demand from individual end-use segments in each of the regional markets has also been provided in this research report. 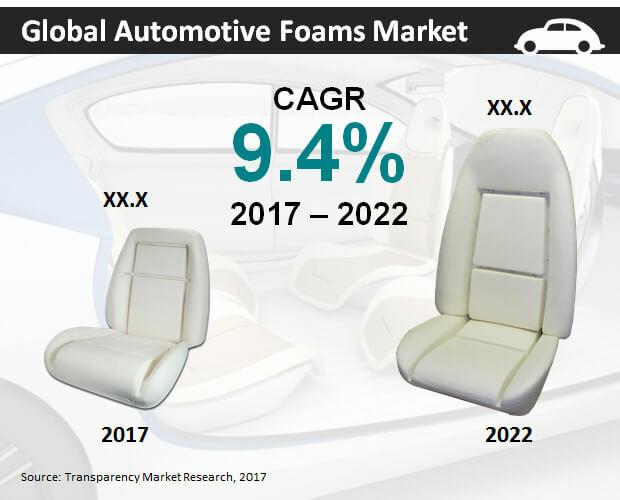 Furthermore, the report estimate the market size of each of the regional automotive foams market in 2017 and make predictions for the coming years. The figures of the regional markets have been calculated on the basis of their performance, in terms of the type of the material-, sales channel-, application-, and the type of the vehicle-based segments. Woodbridge Foam Corp., The Dow Chemical Co., Adient Plc., Recticel, Caligen Foam, Saint-Gobain SA, BASF SE, Lear Corp., Zotefoams Plc., and Bridgestone Corp. are some of the leading companies functional in the global automotive foams market.